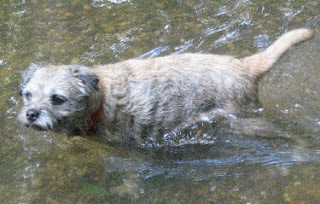 Harry Dog Blog: Dog or Otter? Harry, Give me the Ball ! Harry, Give me the stick! Dog books say that the face of the Border Terrier resembles that of an Otter. Harry went for a drink on a steep bank and ended up falling in. At that point an excited Rottweiler appeared from the undergrowth and started barking at Harry. So Harry decided not to get out immediatly. In fact he got out on the far bank and waited until the coast was clear.